Author(s): Masahiro Kiyama, Ryohei Saito, Satoshi Iwano, Rika Obata, Haruki Niwa, Shojiro A. Maki. Department of Engineering Science, The University of Electro-Communications, P.O. Box: 182-8585, Chofu, Tokyo, Japan. Firefly bioluminescence is widely used in life science research as a useful analysis tool. For example, the adenosine-5′-triphosphate (ATP)-dependent enzymatic firefly bioluminescence reaction has long been utilized as a microbial monitoring tool. Rapid and sensitive firefly luciferin-luciferase combinations are used not only to measure cell viability but also for reporter-gene assays. Recently, bioluminescence was utilized as a noninvasive, real-time imaging tool for living subjects to monitor cells and biological events. However, the number of commercialized luciferase genes is limited and tissue-permeable near-infrared (NIR) region emitting light is required for in vivo imaging. In this review, recent studies describing synthetic luciferin analogues predicted to have red-shifted bioluminescence are summarized. Luciferase substrates emitting red, green, and blue light that were designed and developed in our laboratory are presented. The longest emission wavelength of the synthesized luciferin analogues was recorded at 675 nm, which is within the NIR region. This compound is now commercially available as “Aka Lumine®”. Keywords: Biological window, Bioluminescence imaging, Enhanced emission, Firefly, Luciferin analogue, Multicolor emission, Near-infrared. Affiliation:Department of Engineering Science, The University of Electro-Communications, P.O. Box: 182-8585, Chofu, Tokyo, Japan. Keywords:Biological window, Bioluminescence imaging, Enhanced emission, Firefly, Luciferin analogue, Multicolor emission, Near-infrared. Abstract:Firefly bioluminescence is widely used in life science research as a useful analysis tool. For example, the adenosine-5′-triphosphate (ATP)-dependent enzymatic firefly bioluminescence reaction has long been utilized as a microbial monitoring tool. Rapid and sensitive firefly luciferin-luciferase combinations are used not only to measure cell viability but also for reporter-gene assays. Recently, bioluminescence was utilized as a noninvasive, real-time imaging tool for living subjects to monitor cells and biological events. However, the number of commercialized luciferase genes is limited and tissue-permeable near-infrared (NIR) region emitting light is required for in vivo imaging. 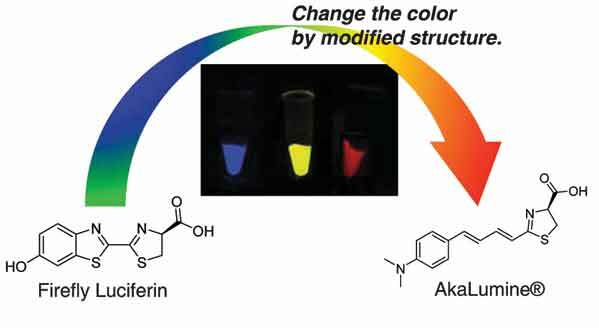 In this review, recent studies describing synthetic luciferin analogues predicted to have red-shifted bioluminescence are summarized. Luciferase substrates emitting red, green, and blue light that were designed and developed in our laboratory are presented. The longest emission wavelength of the synthesized luciferin analogues was recorded at 675 nm, which is within the NIR region. This compound is now commercially available as “Aka Lumine®”.